We were apprehensive about having a whole evening devoted to talking about putting horses to sleep, but at the same time we knew that it really wouldn’t appeal to some, so we didn’t want to mix it up with other horse health topics. It just didn’t seem like the right thing to do. Despite a smaller than usual group for our talks evenings, we were pleasantly surprised at the turn out, and we all came away feeling very positive about the evening. The evening was about giving an overview of the many different things to consider with horse euthanasia. It was not about giving owners right or wrong answers, but about thinking about all the options to enable planning ahead. We are privileged to own animals, and as such we are stewards of their welfare. It is up to us to give a horse a good life and a good death. How many horses die of natural causes? The latest research showed that only 9 per cent of horses die of natural causes, which means in the other 91 per cent of cases the decision to euthanase will have to be made either electively or in an emergency. 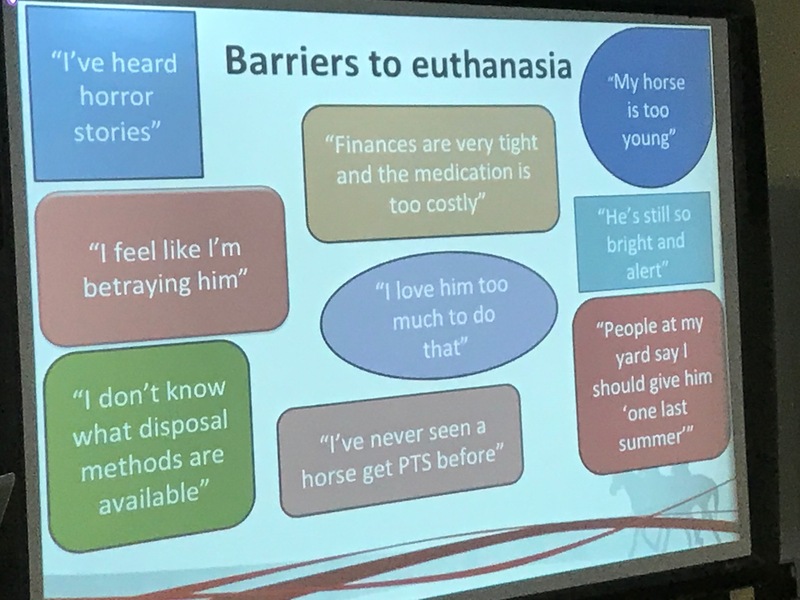 Considering your horse’s welfare and quality of life is imperative when thinking about euthanasia and whilst it is not an easy decision to make, the implications in delaying it can have a much greater impact on their welfare and on your peace of mind. • The passport must be checked, declared and signed not for human consumption. Send back to Passport Issuing Authority. • Requires skill and experience – fewer vets are keeping up with their licenses. • Alternative disposal options – hunt, human food chain. How do vets feel about euthanasia? •BEVA considers that the decision to advise an owner to destroy a horse on humane grounds must be the responsibility of the attending veterinary surgeon, based on his assessment of the clinical signs at the time of the examination, regardless of whether or not the horse is insured. The veterinary surgeon’s primary responsibility is to ensure the welfare of the horse. •Insurance Companies frequently require some form of examination after death. •BEVA recognises that there may be occasions when the attending veterinary surgeon will advise euthanasia but such a decision may not necessarily lead to a successful insurance claim. •It is important that all parties are aware of this potential conflict of interests before a horse is destroyed. It is the owner’s responsibility to ensure compliance with any policy contract with an insurer. Companions to that horse. Ideally they should see the horse after euthanasia. Ashes back or other options after euthanasia – there are now many options for incorporating tail hair into jewellery. Include your thoughts about these decisions in a written plan (that someone else is party to, in the event that you are not contactable. FATE offer FREE advice and support before, during and after having to have your horse put to sleep. They will even be there on your behalf or be with you to help you cope with this terrible time. Many horse owners probably don’t know about this incredible service that they offer. The following websites offer advice and support and objective measurements of welfare and quality of life in horses. Sophie gave an overview of the free support available to horse owners from the British Horse Society, World Horse Welfare and the Blue Cross. Don’t be afraid of the emotions you will go through. They are normal and natural. Get support from the right people. It was really helpful to know that grief and a series of strong emotions during the bereavement process are natural. Many people described feeling judged or silly because off these emotions in relation to an animal. However studies have shown that pet and horse loss can elicit the same range of emotions felt when a human family member dies. Having Phillip speak about his experiences was just brilliant. We all wondered about how the tales of the person who collects the bodies we have sadly put to sleep, would go. Phillip is renowned for his utterly respectful approach to end of life situations, as well as the many other roles he finds himself in, often with horses and owners in distress. Phillip provides an ambulance service at many race meets, not least at the Cheltenham Festival, and also picks up many very much alive horses for all sorts of reasons, including moving and relocating horses for the RSPCA and horses involved in road traffic accidents. Phillip recounted stories about how he first became involved in horse collection through seeing a horse that wasn’t collected promptly at a point to point. After losing his entire dairy herd to the horrors of Foot and Mouth disease he decided to start his own business focussing on prompt and appropriate euthanasia and collection and on ambulance services for horses. The thing that clearly resonates through Phillips tales is his strong sense of welfare for the animal, and respect for the owner. He talked us through approaches to nervous and head shy horses, and through what happens after the horse has been put to sleep. The crematorium he uses in North Wales is highly regulated, and he detailed the process of individual creation for owners that request it. 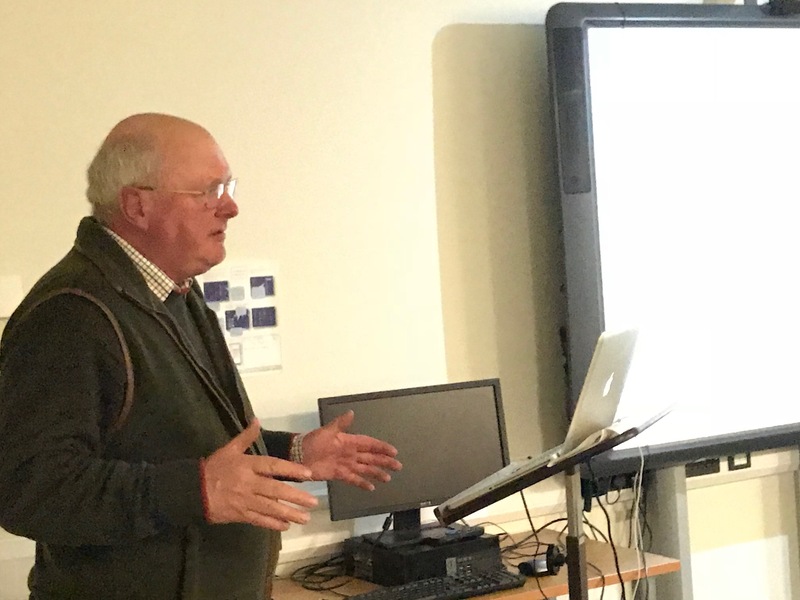 His talk was interspersed with anecdotes which show the love and respect he has for the world of animals and the importance of their welfare at all times. He told us about his ferrets that he used to take to dinner parties, and how devastated he was when he had to put them to sleep. And we heard about the heat from the incinerator at the crematorium, and how in the summer months hundreds of bats could be seen feeding on insects in the pillar of heat rising from the crematorium. The small unexpected consequences of saying that final farewell that we just wouldn’t think about. As with the other speakers though, Phillip’s take home message was to think of the horse first and foremost. Make the decision early not late and be brave.